When it comes to learning how to cut and sew patterns, we need proper instructions. 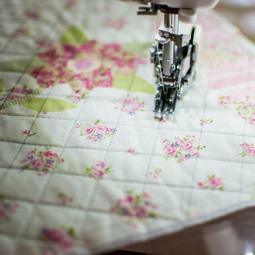 Even though it seems easy at first, sewing is a skill only those with an extreme level of perseverance can master. It’s not difficult per se. However, there are a lot of factors we need to take into account when sewing a simple shirt or a dress, not to mention creating our own pattern once we master the art of sewing. Still, we don’t want to scare anyone off now. In fact, we are here to show you how easy it is to make patterns work. Anyone can use them to create a piece of garment that will be truly unique! The first thing everyone has to realize is that we can get sewing patterns pretty much anywhere. Back in the day, people had to make their own, as there weren’t any magazines such as Burda. However, nowadays, we can even download them online and buy them from specialized shops. Still, having a pattern doesn’t mean we will be able to use it immediately. 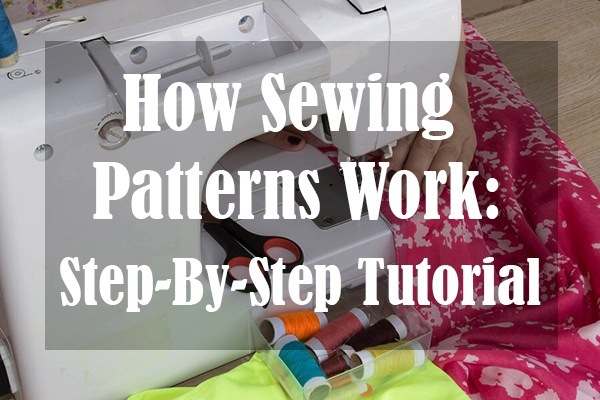 There are a few things we first need to consider before we learn how to cut and sew patterns. Sewing clothes is a bit different than just buying it, as with sewing, we have a chance to make something entirely unique. Moreover, we can make the clothing fit us like a glove, but we’ll need to figure out how to tweak different garments. In any case, the first step to sewing anything, whether it’s a shirt or a dress, is taking our measurements. For this, we will, of course, need a good tape measure and someone to help us measure our body. the width of our forearms, wrists, etc. It’s a good idea to actually just measure our whole body. That way, we won’t have to employ another set of hands (or call our friend) everytime we want to sew something. If our weight doesn’t change too often, these measurements will be suitable for sewing a variety of different clothing items. Now, this is where we can easily make a mistake. Magazines like Burda, for example, come with multi-sized patterns. Thus, we can use them to make clothing in a range of sizes. That’s good news if we want to master sewing and possibly make clothes for our family members. However, even though these patterns have different markings that indicate which size we should use, we should never cut them out. Instead, we ought to use tracing paper to make our own patterns that will be perfect for our dress size. That way, we won’t ruin the pattern for other sizes and will be able to use it for many years to come. How to trace a pattern? Tracing a pattern is not that difficult. After all, even if we make a mistake, we can easily get some more paper and start over. The first thing we would need to do is get a pencil (or even a marker) and layer the tracing paper over the pattern. In order to keep it in place, we can pin it to the pattern. The more pins, the better the results; this isn’t an area where we should save up on these materials. Now, all those sizes will have different markings. For example, a size ten would be indicated with a full line, whereas a size twelve would have a different type of line, perhaps a broken one. Still, even this isn’t a standard. The best thing we can do is look closely at the instructions and read the whole pattern carefully. Usually, there are markings on the sides of the pattern parts that say which size is which. Once we’ve determined which size we’ll use, all we have to do is trace the lines on top of the paper. And don’t worry if you make a mistake; even if we go up a size, it only means we will have more space for alterations later on. Usually, sewing patterns have something called an “allowance.” This is the difference between our body measurements and the finished garment measurements. It shows us how the garment will fit: true to size, loose-fitting, etc. It’s safe to say that having an allowance is a good idea, as we can easily alter the garment afterward. However, altering something is a bit like rocket science in the world of sewing, and it’s not that easy to do. Therefore, if we are just starting out with honing our sewing skills, we can just leave this allowance and later get a tailor to trim it according to our body measurements. We could also not add the allowance, but if we make a mistake, that means we cannot use the garment at all. In the end, it’s always better to have a bit extra than to have less fabric than we need when learning how to cut and sew patterns. Which item should we sew first? Although we would love to make an elaborate, corseted dress immediately, chances are we will mess up because we don’t have enough experience. Thus, it’s best to start with something small, like a T-shirt, a blouse or an elegant skirt. Moreover, we should look for designs that are not too complicated, i.e., are marked as “easy” in the magazines or on the pattern itself. The type of fabric we choose will depend on the type of garment we’re doing. In Burda, we will always find suggestions for different types of clothes. A quick Google search will tell us what types of fabrics are there, but it’s always better to go to a store and feel each one. That way, we’ll logically deduce which garment would be suitable for something we want to wear. In any case, we don’t recommend starting with expensive fabrics right away. 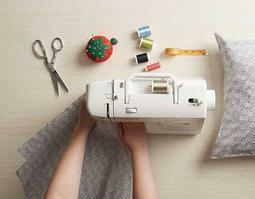 In fact, if this is your first time sewing, start with some plain canvas. Even if you mess up, you can throw it away and start again! What’s more, we shouldn’t go for stretchy fabrics immediately. We would need to calculate how much the fabric would stretch on our body, which is way too complicated for a beginner. How much fabric do we need? Before we cut and sew patterns, we will need to determine how much fabric we’ll need for the garment we’re trying to make. Luckily, we will also find these suggestions in Burda or similar magazines. A good rule of thumb is never to buy less than two meters of fabric. Those two meters should be enough for a sleeveless dress, which means it will be enough for a skirt or a shirt as well. However, if we’re adding sleeves or making pants, we will need a bit more. Having extra fabric is never a bad thing, as we can always use the remainder for something else. Just imagine sewing a dress and having a scrunchie made from the same material! We’ve figured out which fabric to use, and we know our size. Now, it’s just the matter of reading the pattern correctly and understanding all the different markings on it. First things first, we will have to read the sewing pattern completely. Now, what does this mean? Well, it entails not only reading the pattern itself but the instructions as well. The instructions are our best resource when it comes to connecting all the different parts of the garment. For example, in Burda’s patterns, we have a small box containing an illustration of all the necessary parts of the pattern. Each part has a number. Now, it’s a good time to mention that some of the parts of the pattern will, of course, be repetitive. When making sleeves, we won’t find two different patterns in the magazine. It’s expected that we make two patterns and call them, for example, sleeve one and sleeve two. We can usually find information about the number of the same patterns we need below the illustration mentioned above. What do all those markings mean? When we carefully examine any sewing pattern, we will notice a few other markings, apart from those that tell us which size we’re tracing onto the paper. These markings are of the utmost importance if we wish to cut and sew patterns perfectly. We want to make the garment fit exactly how it should, i.e., how it looks in the magazine or on the model. Thus, let’s see what the most basic symbols are. The symbol of the grain line is a double-pointed arrow, and it indicates in which direction we have to lay the fabric onto the pattern. In contrast to popular belief, we cannot just cut and sew patterns however we want. Fabric consists of two types of threads: the warp threads and the weft threads. The first ones are the strongest, so it’s essential that the grain line goes in that direction. Otherwise, our garment will look strange, and it won’t fit us well at all. Also, don’t forget that the grain line should be parallel to the selvage of the fabric, i.e., the non-frayed edge of it. As the name says, this is the line according to which we should cut the pattern. Note that if we are tracing the pattern on top of the paper, we would need to add this line as well. Moreover, if there are no seam allowances, we would need to add those too. Usually, the symbol for this type of line is a broken, solid or a dotted line and an image of scissors. Although it looks similar to the grain line, this symbol has a bold line that’s parallel to the length of the bent arrow. It indicates which edge of the pattern piece we should align with the fabric fold. If we fail to do this, we won’t get a perfect clothing item, as the pieces won’t fit together properly. In essence, the piece won’t be as proportioned as it should be. 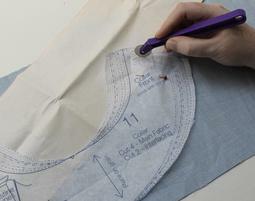 In order to cut and sew patterns accordingly, we ought to place the bold line that goes under the arrow onto the fold. Like in the case of the cutting line, this line says where we should stitch the fabric. It usually consists of a broken line, but sometimes it also has a few other symbols next to it, such as a sewing foot and arrows. When stitching, we ought to go along that line and make sure we are going in the proper direction (to which it’s pointing). These symbols come in the shape of diamonds or triangles and indicate the joining points on the seams. In order to get the garment to fit perfectly, we need to line up the diamond or triangle bases of different garment pieces. This line consists of two bold lines that show where we can either shorten or lengthen a garment. The most important thing about this particular line is that we shouldn’t go below or above it. We can only use the amount of space it gives us to adjust the clothing item. Otherwise, we might change the whole pattern and destroy our creation. Now, these are some of the most important symbols we can find in a pattern. Darts indicate where our body naturally curves, so we need to fold and stitch according to them. That way, our garment will fit us well and exactly how we planned. The whole point of the dots we can see on the patterns is to know where we should add pockets, where the collars should join, etc. Moreover, these dots can also indicate the gatherings or where we should add the tacks in order to align two pieces of fabric flawlessly. This symbol usually comes in the form of a zig-zag line, and as the name suggests, it indicates where the zipper goes. Usually, the placement of the button is determined with an X, while the buttonhole consists of a simple line. Obviously, the X stands for where we should sew in the button. Meanwhile, the buttonhole is the exact length of the hole through which the button will go. As such, these two go on the opposite sides of the garment. Although some patterns don’t have this symbol, we might come across it in the beginner patterns. It usually consists of a line and a squiggly bracket, as well as some fractions. Basically, it’s a guide that shows us how far from the edge we should stitch the garment. In order to cut and sew patterns, we will need some essential tools to do it properly. The regular scissors we have at home just won’t do. For best results, we ought to invest in sewing scissors. We can find a pair of such scissors in pretty much any specialized store. However, we should have an additional pair as well, as these go dull pretty quickly. Most of the time, 8-inch scissors are perfect for cutting patterns. One thing to note here is that, although we will be going through the cutting lines, we shouldn’t despair if we cut away too much. If we have some more tracing paper, we can create another pattern. In any case, though, we can always use some tape to patch up the pattern. We didn’t cut away the fabric, so there’s no real harm done. Usually, the pattern guide will have an illustration of how we should lay out the pattern pieces. These will go along the grain line we mentioned earlier and allow us to stay mistake-free until we start sewing. We ought to be careful here and ensure that we’ve read the instructions correctly. Specifically, we should note where the nap is and on which side of the fabric we should add the pattern pieces. 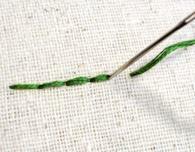 To ensure the pieces don’t move around, we can use pins or needles. These also come in handy later on while sewing, as we can use them to connect two pieces of fabric and ensure we don’t stray from the stitching line. Once we’ve laid out the pattern pieces, it’s time to use some chalk to mark the pattern. That way, we won’t cut away too much or too little. We can also do this with tracing paper and a tracing wheel, although the chalk method is a bit more efficient and reliable. Finally, in order not to confuse ourselves, we can mark each piece individually. If we’re particularly insecure about our sewing and pattern skills, we can even write words on the pieces to make sure we don’t make a mistake. Finally, if we love the pattern and want to use it again, but it’s too fragile for us to keep it, we can always trace it onto a stiffer type of paper or cardboard. And that’s pretty much it. Now everyone can learn how to cut and sew patterns without making multiple mistakes in the first few minutes. Hopefully, you’ve learned a lot from this article. However, if you have something to add or a piece of expert advice you would like to share, please do so in the comment section below. 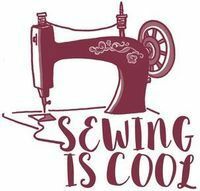 Moreover, if you know someone who would love to learn how to cut and sew patterns the right way, don’t forget to share this article with them!